What could be a more perfect pool party theme than a Little Mermaid Party?! It doesn't need to be anyone's birthday - just a fun excuse to get a bunch of little mermaids together for a fun afternoon at the pool. We host an annual Under the Sea Party/Mermaid party every summer - adding new games and decorations based on the ages of the kids and their ability to swim. Little Mermaid party supplies are in abundance - you can find them at local stores like Target, Hobby Lobby, or party supply stores. 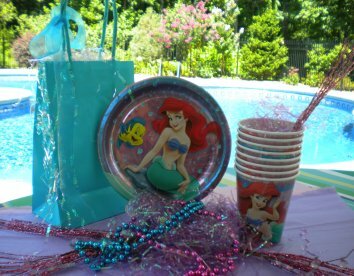 You can buy Little Mermaid plates, cups, napkins and tablecloths along with party supply bags and banners. If you want to make your shopping really convenient you can go on line to Amazon. They sell an entire party package that includes all your paper good. If you enjoy being creative you can make and create some of your own party supplies and even have fun doing it with your kids. 4. Under the sea, Under the sea Darlin' it's better down where it's wetter Take it from me.... that this birthday celebration will be fathom's of fun. Be sure to include instructions asking the guests to wear their swimsuits and to bring a towel. For the birthday girl, provide her with her one mermaid fin that can be worn in and out of the water. They come in sizes that fit young girls from around 3 -10 years old. The fabric has a 3D appearance of scales and is offered in a variety of colors - blue-green, blue, magenta and pink. It is made of swimsuit fabric so it can be worn in and out of the swimming pool. Surprise your birthday girl with a gift she will always remember. Hide Easter eggs around the perimeter of the pool that are filled with coins, stickers or candy. Assign each guest a color - only Anna picks up the pink eggs, Carolyn the purple eggs, etc. and then give them an Ariel plastic bag to gather them. You get 8 of them for less than $5 and free shipping if you are a Prime Member. How would you like to get all your party favors picked out for you? This package takes care of filling your 8 party bags with flutes, spin tops, sea shell rings, bracelets, hair clips and prism viewers for a total of 48 pieces for less then $9.00. Little Mermaid Favor Pack 48 Pc. I use Amazon for lots of my party supplies - this 6' Little Mermaid scene makes a perfect backdrop for your party and photo ops with the kids. All plastic so it can get wet - tape it to a central area on your pool fence. It is less than $7 and free shipping for Prime members. 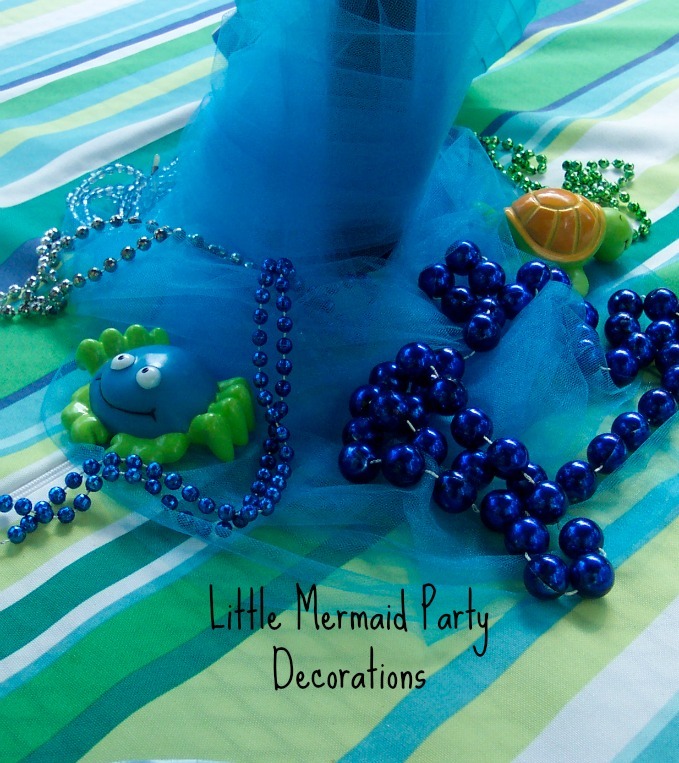 Little Mermaid party decorations can be store bought or home-made. 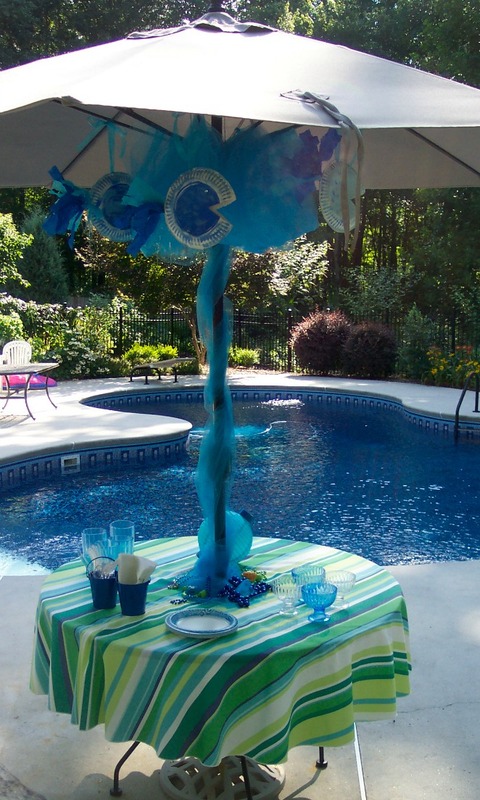 For our Little Mermaid Party we decorated the patio umbrella with blue netting, draping it around the patio ribs, wrapping it around the umbrella pole and then piling it around the bottom of the pole. 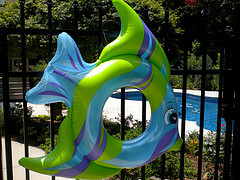 Simply buy a Tropical Fish Inflatable Swim Ring and tie it on the gate to greet all of your guests. I use clear plastic fish wire or string. The kids were all instructed to come in their swimsuits because as soon as they stepped through the entrance they were greeted with a cooling mist from our outdoor mister. There is nothing quite like floating bubbles for a Little Mermaid pool party. Place the bubble machine at the entrance to the pool when the kids first arrive and then move it to the pool area. After making several different purchases I finally found one that worked well and we used it all summer. Creative Motion Bubble Machine would work for about an hour or so and then it needs a rest - but will start again. bubble machine Be sure to keep it filled with bubble juice - the one I used and would recommend is Froggys Fog Pro Bubble Juice. Get the gallon size because you go through it pretty fast. Inflatables are great for pool parties - inexpensive, can be used for decorations and then used in the pool for some pool fun. These mermaids are nice and big 36" tall and are around $7.00 for two of them. Set one out by the pool gate or use them for photo ops with the birthday guests. Then let the kids have fun with them in the pool. Use balloons at the end of the driveway or by the party table where everyone can enjoy them through out the day. 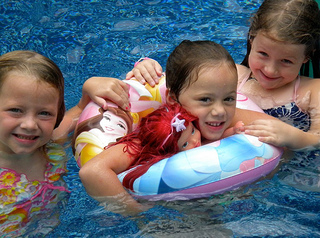 Inflatable sea creatures can be used for decorations in and out of the pool. Easy to blow up - set them by the pool gate or by the party table. Use them for pool party games as well. The shimmering blue netting that is wrapped around the pole, is then pooled around the bottom of the pole. Set out colorful beaded necklaces and plastic crabs, turtles, fish or seashells. These plastic sea creatures are actually dive toys that I found at a store. So after the guests are done eating you can use them for diving games. 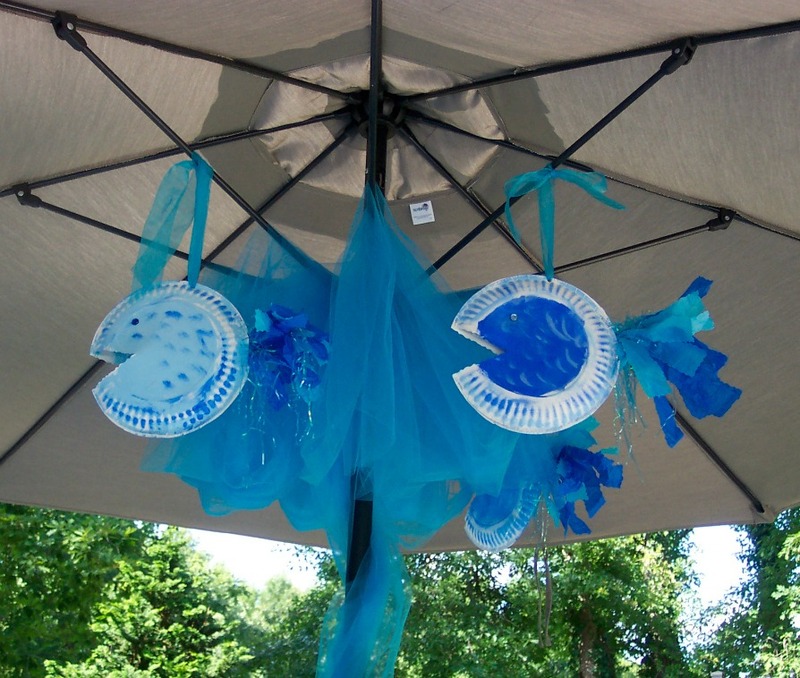 Kids can help with the decorating by making these paper plate tropical fish. Simply paint two paper plates, cut out the mouth, and staple the two plates together. Cut blue tissue paper into strips of 2" x 5" and gather several strips together and staple them into the other end of the plate. I had some shimmery blue Easter grass that I stapled into the tail as well. You can use stick on eyes, rhinestones or buttons as eyes. I found these blue rhinestone stickers in the dollar section at Target. Hang the fish from the patio umbrella, on the pool gate or put them on blue painted dowels to set out along the perimeter of the pool. Take your little mermaids on a trinket dive for colored necklaces, bracelets, and rings. Dive for seahorses or rescue Ariel from surrounding "sharks." 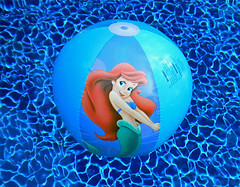 Play "hot potato" type game using a Little Mermaid beach ball playing the song, Poor Unfortunate Souls. Music provides a festive, fun feel to the theme of a party. 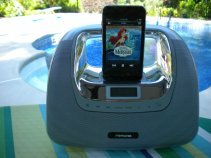 So of course, the Disney Little Mermaid album, played on your portable iPod speaker lets your mermaids know that they are truly Under the Sea. You can have the music played just as background music or incorporate a particular song for a game. Our little mermaids danced to Under the Sea as they paraded around the pool for the Mermaid Parade holding painted tropical fish decorated with ribbon and crepe paper. You don't need to be a fancy cake decorator to serve these fun and delightful cupcakes. Make or buy your favorite cupcakes. Use white frosting with just a drop of blue food coloring and sprinkle with blue sugar. 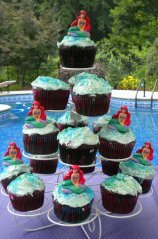 Top the cupcakes with Ariel figurines. Cupcakes are easy to make and serve. Kids can eat them with their fingers and then play with their own truly Little Mermaid.